As we begin our school year, safety is first and foremost for our students. Their safe arrival and departure is our top priority, as is their education. Please take a moment to review our Drop Off and Pick Up expectations! As you know, the first few weeks of traffic can be more congested, so we are sending out this reminder. Thank you for your patience and caution when dropping off your child and picking them up from the school parking areas. Attention: The City of San Clemente has made pedestrian safety modifications to the entry and exit of the front Via Socorro parking lot. The lane was narrowed to one lane so please drive slowly when entering and exiting. Please give yourself extra time as this modification could cause entering and exiting delays as motorist become familiar with the change. Please make sure to enter the parking lot, and turn left to the lot with three lanes. The front driveway is for BUS drop off and pick up ONLY, so please do not drop off/pick up there. There are three lanes for drop off. The right and left lane are for pick up and drop off only. The center lane is for pass through after you drop/pick up. If loading/unloading car from the left lane, please have students exit on the left of your vehicle, walk to the cross-walk, and cross when safe. When in the right lane, have students load/unload from the right side of your vehicle, walk to the crosswalk, and then cross the first driveway. Please show caution and drive slowly when moving into the center lane for exit. Please follow all safety signs and signals posted by the City of San Clemente. This parking lot is a heavy traffic area, especially in the afternoon. Please do not cross speed bumps or travel against posted direction. When dropping off or picking up students near the north gate of the parking lot (near park), please enter the parking lot cautiously and drive at a slow speed. Stay to the right of the speed bumps, single file, and pull up to the north end of the lot. Please pull all the way around before stopping your vehicle to allow a smoother flow of traffic. Please load and unload students from the right side (yellow sidewalk side) of the lot to ensure their safety. When finished loading and unloading, please check for cars to your left and proceed through the remainder of the parking lot with caution. Do not park in the parking lot and expect your child to be able to cross. 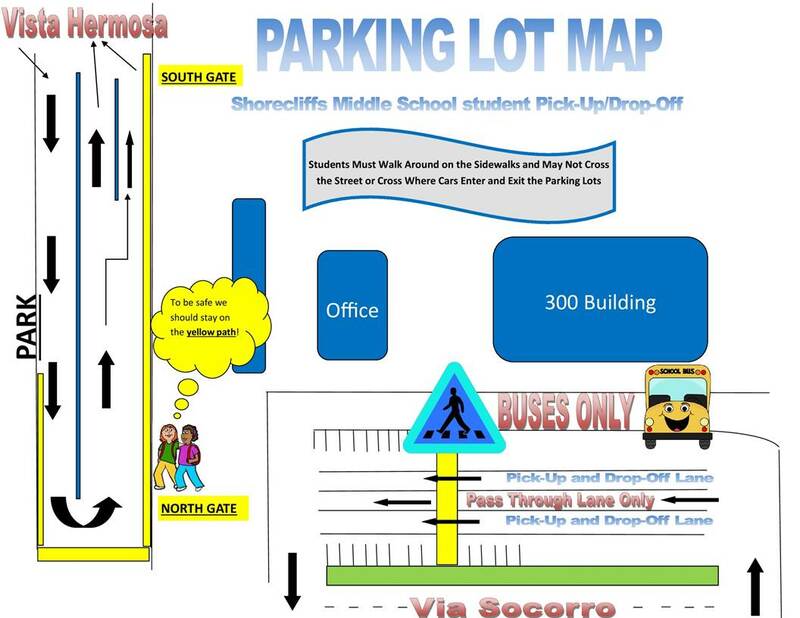 As the map reflects, students will need use the yellow sidewalk to be picked-up in the designated areas. When dropping off or picking up from near the south gate of the lot, please enter as stated above, and pull all the way around the lot. To drop off or pick up students at the south end, pull into the right side of the pick-up area and have students load or unload on the right hand side of your vehicle. Do not park or wait for your child next to any curb that is marked red. Violators will be ticketed by law enforcement. Be cautious when leaving the parking area, as the middle lane merges with yours. Remember, do not park in the parking lot and expect your child to be able to cross. As the map reflects students will need to walk around on the side walk to be picked-up in the designated areas. If you are in the pass through lane please do not cut into the pick-up lane (this can cause accidents). If you are picking up your child at The Outlet’s, they are expected to follow all school and city safety laws. They must use the crosswalk, and they should walk across the bridge appropriately. We work closely with The Outlet’s security and are informed of any misbehaviors that occur before or after school. Please do not pick up your child from the red curb on Vista Hermosa. Deputies will be ticketing those who are parked illegally. Please refer to the map attached for a visual indicator of our expectations. Our goal is to ensure the safe drop off and pick up of all of our students, and we need to partner with you to ensure this happens. If you pick up from The Outlets, please reiterate to your child the importance of using the crosswalk and crossing the bridge in a safe manner. Students should never be picked up from the main Vista Hermosa street for safety purposes. Again, please be patient as our new families navigate their way through the first few weeks of drop off and pick-up. Thank you to all those pulling forward and following procedures.